Companies like Nest and Netgear are among the big names in the wireless home security camera market, but there’s another brand you won’t soon forget after you check out this killer dome camera on Amazon. 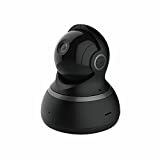 The YI Dome Camera steams 1080p HD video to your iPhone or Android phone just like any other security cam, and it has all the basic features you would expect like motion detection, two-way audio, and night vision. But this Yi camera can do something no Nest Cam can: it can pan and tilt all around the room using controls right in the mobile app. Oh, and it costs $50 on Amazon instead of $200 like the Nest Cam! 1080p High-definition, 112° wide-angle advanced glass lens combined with 345° horizontal & 115° vertical rotation range create a complete 360° coverage. Advanced night vision with 8 built-in 940nm infrared LED beads extend the viewing distance to 3 meters in pitch dark with no light pollution, so your baby or pet will not be disturbed by LED glare. Responsive and advanced microphone with a built-in anti-noise filter for a clear 2-way Audio experience. Intercom Mode: one party to talk and listen at a time or Hands-free Mode: both parties talk and listen freely for maximum flexibility. Receive real-time Activity Alerts while you’re out. 10-sec motion tracking records and centers the moving object. Bookmark your favorite positions (up to 8) and return to them at the tap of a button. Select Auto-Cruise to survey the area 360° horizontally or cruise your bookmarks, suitable for large areas that need a quick scan (and tracks moving objects). YI Dome integrates with your YI Home family in one simple interface. User-friendly and intuitive app to customize your settings: activity alerts, auto-cruise, bookmarks, camera sharing, customize schedules, and more. Supports connectivity to a large number of devices with the same app/account for maximum convenience. Available for iOS and Android.